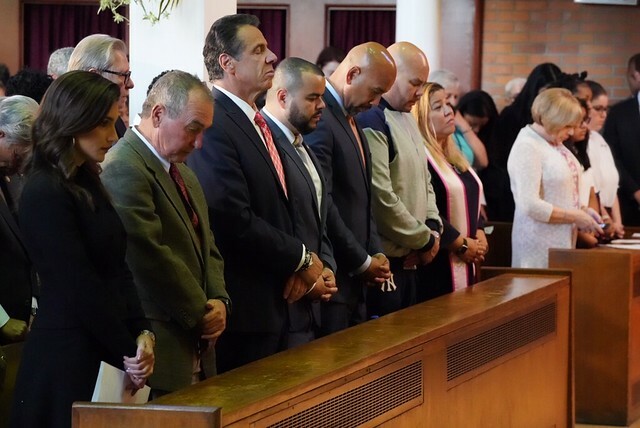 Governor Andrew M. Cuomo today announced New York has partnered with Latino Justice, a national civil rights organization, to identify displaced Puerto Ricans living in New York who have been impacted by the federal government's disgraceful response to Hurricane Maria, which made landfall on this day one year ago. At this time, the state has identified several displaced Puerto Ricans living in New York who will serve as plaintiffs in a suit against President Trump and the federal government for disparate treatment in failing to provide services and resources to the island during this catastrophic event, and this partnership will serve to bolster the state's efforts. Several of these potential plaintiffs attended a memorial event at which the Governor spoke earlier today. "As we mark the one-year anniversary of one of the deadliest storms to hit the United States, it is as evident now as it was then that the people of Puerto Rico have been all but forgotten by President Trump," Governor Cuomo said. "In this country there are no second-class citizens, yet we witnessed blatant inconsistencies in Washington's response to disasters in Florida and Texas while leaving our fellow Americans in Puerto Rico without even basic necessities. Our federal government must be held responsible for these immoral, disgraceful actions, and with this lawsuit, we will bring justice to those who were wronged and continue to support the people of Puerto Rico until the island is rebuilt and recovered, and more resilient than ever before." "We're helping our fellow citizens from Puerto Rico to ensure their recovery and safety in New York following the devastation of Hurricane Maria last year," said Lieutenant Governor Kathy Hochul, who attended today's event. "We have partnered with Latino Justice to file a lawsuit against the Trump administration for its egregious lack of recovery efforts following the storm. New York stands with our brothers and sisters to fight back against the lack of aid and protection from the federal government that continues to affect families impacted by the disaster." As reports continue to indicate that nearly 3,000 people died in aftermath of the hurricane—making Hurricane Maria one of the deadliest disasters in U.S. history—President Trump has politicized the issue, refusing to accept these reports as fact. After calling the federal government's response to Hurricane Maria an "incredible unsung success," it is clear that President Trump is unable or unwilling to recognize the devastation the hurricane left in its wake and provide the assistance necessary to help the island recover. A three week wait: It took at least three weeks for federal helicopters - critical for saving victims and delivering emergency supplies - to fly above Puerto Rico, contrasting with the 73 U.S. Northern Command helicopters that flew over Houston within six days of Hurricane Harvey. Lack of funding: Nine days after the hurricanes, FEMA had approved $141.8 million in individual assistance to Harvey victims, versus just $6.2 million for Maria victims. Lack of food and water: During the first nine days after Harvey, FEMA provided 5.1 million meals, 4.5 million liters of water and over 20,000 tarps to Houston. In that same period, FEMA delivered just 1.6 million meals, 2.8 million liters of water and roughly 5,000 tarps to Puerto Rico. Sparse resources: Nine days after Harvey, the federal government had 30,000 emergency and response personnel in the Houston region, compared with 10,000 at the same point after Maria. Additionally, it took just 10 days for FEMA to approve permanent disaster work for Texas, compared with 43 days for Puerto Rico. Unacceptable relief: Seventy-eight days after each hurricane, FEMA had approved 39 percent of federal applications for relief from victims of Harvey, versus just 28 percent for Maria. In June, the Governor announced that the SUNY Board of Trustees and CUNY Board of Trustees would extend in-state tuition for students displaced by Hurricanes Irma and Maria. The extension of the authorization allows students from Puerto Rico and the U.S. Virgin Islands to attend stated-operated colleges for the 2018-19 academic year at a lower cost to ease the burden as their families recover from the destruction following these natural disasters. In Academic Year 2017-2018, 255 displaced students took advantage of the in-state tuition rate at CUNY colleges. While enrollment data is not yet available across SUNY for Fall 2018, there were 137 undergraduate students enrolled from Puerto Rico displaced by Hurricanes Irma and Maria in 2017-2018 academic year that received in-state tuition rates. ...with this lawsuit, we will bring justice to those who were wronged and continue to support the people of Puerto Rico until the island is rebuilt and recovered, and more resilient than ever before.